While visiting central Japan in April, don’t be surprised as crowds flock to green spaces to take in the sakura (cherry blossoms) blooming from trees. For anyone who’s seen them, it’s a stunning sight that makes you dream of floating on clouds, lollipop lined roads and all things pretty. 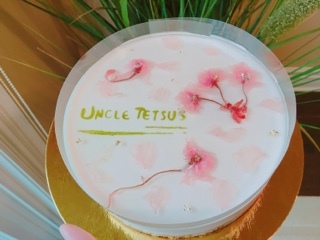 Uncle Tetsu’s Unionville location has recently incorporated the ingredient into their no-bake cheesecake ($35 for a full cake that comfortably feeds six or $8 for personal-sized cup) and the effect is equally stunning. As I lifted the lid on the box, my first instinct wasn’t to snap a picture, but rather take in the beautiful sakura blossoms – to stop and stare at the flowers one could say. 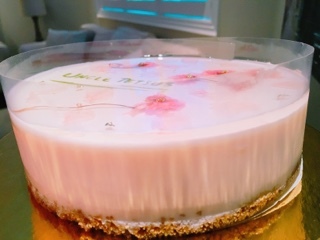 The cherry blossoms, along with translucent petals and pieces of gold leaf are secured onto the blush cheesecake layer with a lightly sweetened gelatin. The cake’s texture is a cross between a mousse and gelatin, with cheese flavour peeking through in the background alongside a sweet floral essence. The actual sakura tastes neither like cherries or flowers, rather has a kick of salty sourness having been pickled in salt and ume vinegar. Aside from the cherry blossom, the dominant flavours from the cake is the lovely graham cracker crust – it’s that buttery element that really tastes like cheesecake. Overall, the cheesecake is delicate and light. With no overpowering flavours, it’s a safe cake for larger crowds (bridal or baby shower anyone?) or with the whimsical elements something that would delight children. 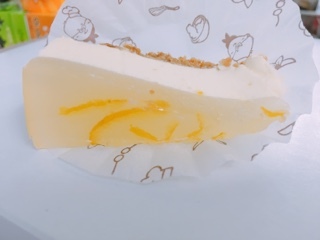 For a more robust flavour, the yuzu no-bake cheesecake ($35 for cake or $8 for cup) incorporates a potent citrusy taste, especially if you get a piece of the fruit’s rind. Launching for Lunar New Year, the cake’s refreshing and its tartness likely welcomed after a filling family meal. 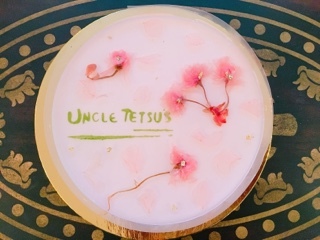 Until February 10, 2017, the Toronto Gourmet Club is providing its food loving members a 20% off voucher for Uncle Tetsu’s sakura cheesecake. Simply register for free on their website and the voucher will be emailed to you. Here’s hoping the voucher will be a step at encouraging you to stop and smell (and eat) the flowers. Disclaimer: The cakes were provided on a complimentary basis. Rest assured, as noted in my mission statement, I will always provide an honest opinion.